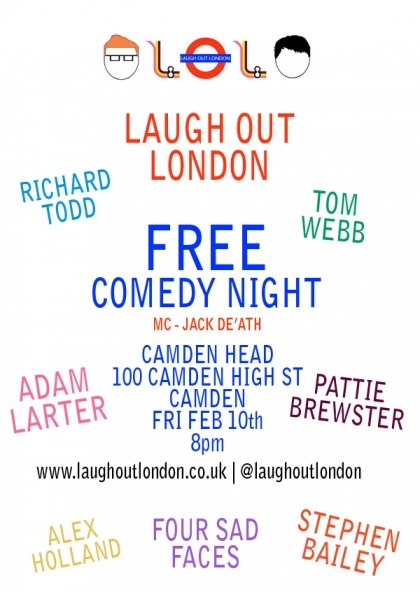 Another FREE night of cackles in Camden (or something like that) comes to you thanks to Laugh Out London in our Valentine’s Special. For yes, at 8pm on Friday Feb 10th, we’re back at the Camden Head, Camden High Street, with a mix of the weird and the nice, in what promises to be a hilarious evening of charms, confusion and exploding cats in the course of finding love through laughter. There’ll be all the usual games too, and some more toys to keep entertainment levels at a maximum throughout. MAXOTAINMENT. Laugh Out London in Piccadilly….